We don't employ salespeople, we're all mechanics here. 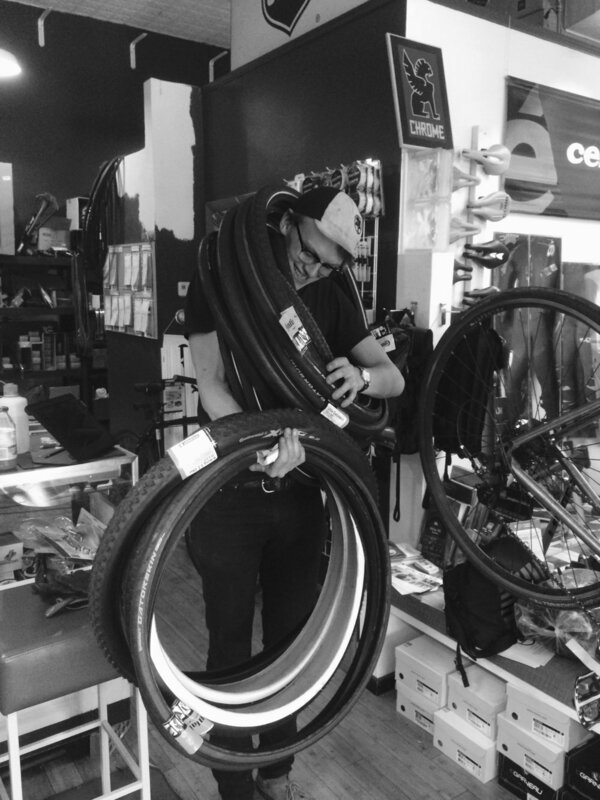 Brad was on the University of Michigan Cycling Team, completed an Ironman in Switzerland, and now regularly finds himself up to his elbows in bike grease at the shop. His current ride is the Focus Mares AX built up for the dirt roads. Cole is a native Michigander and a cycling enthusiast. He's an avid race participant and you're likely to find him on the course with his Cervélo or cross bike. Matt grew up in Colorado. The son of a bike mechanic, he's had an interest in bikes since before he could speak. He enjoys the simplicity of commuting on two wheels and has over 6,000 miles on his All-City Macho Man Disc to show for it. Sam is a Michigan triathlete. He's passionate about cycling and running, and likes nice bikes. When he's not in the shop, you're most likely to find him on his Foundry Overland or training on his Colnago K-ZERO. FOR CYCLING AND THE PRODUCTS WE CARRY. If you need directions to the best local trails, the latest in cycling gear and technology, tips on dressing for the weather or want our opinion on the best bakery to stop at for your next ride, we're ready and look forward to helping.